Shatterlocks Infant and Nursery School is a fully inclusive school. We provide an environment where all pupils can fully access a broad, balanced and creative curriculum and fully participate in all the activities of the school, irrespective of ability, disability, race, gender, ethnicity or social origin. As a school we can access a range of services and professional support through the LIFT process. (LIFT – Local Inclusion Forum Team) Please see the SEN report for parents for further information. Kent also provide a range of services available which is called the local offer, these services are available by accessing the Kent Website. Kent’s local offer is all about making it easier for parents and carers to find out about services available to 0-25 year olds with SEND. If you have any questions or concerns about your child's SEN provision, please make an appointment at the main office to speak to one of the Inclusion team. The Thrive approach is the early identification of emotional developmental need in children. When you address emotional developmental needs it builds a child’s resilience and supports children to engage in learning. 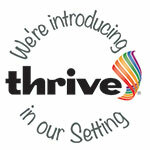 The Thrive approach sets out the age appropriate developmental tasks of children. This knowledge can be used to shape provision and make the best use of learning. This enhances their emotional and social skills, improves their emotional well-being and develops emotional literacy. Mrs Swaffer is our Thrive practitioner.